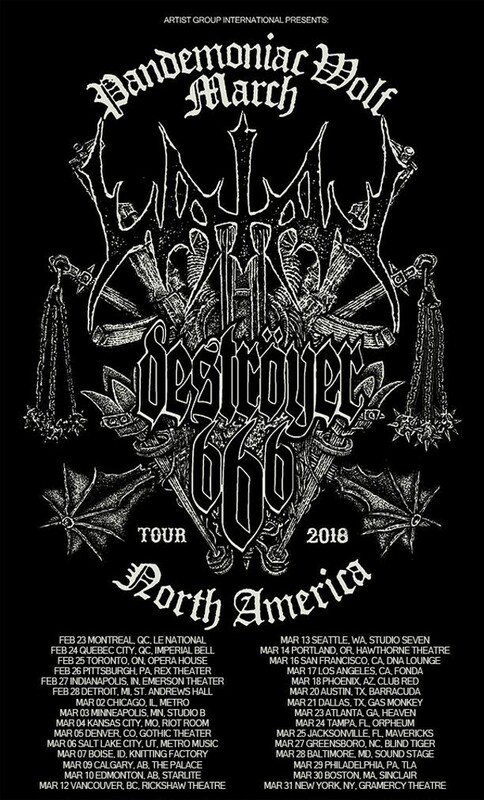 DESTRÖYER 666 are embarking on their previously announced North American tour tomorrow. DESTRÖYER 666 will join WATAIN on their “Pandemoniac Wolf March”, featuring dates across Canada with label mates REVENGE. A full list of confirmed tour dates can be found below. DESTRÖYER 666 will also release a new mini-LP titled ‘Call of the Wild’ on this Friday, February 23. ‘Call of the Wild’ features three new tracks, and re-recorded version of their live favorite “Trialed by Fire”. ‘Call of the Wild’ will be released as a CD Digipak, as well as a limited edition 12″ LP. Pre-orders for this mini-LP are available at the Season of Mist E-Shop. DESTRÖYER 666 are streaming the ‘Call of the Wild’ title track here. No strangers to the scene, K.K. and DESTRÖYER 666 are back spitting fire, venom, and vitriol! Legends in extreme underground metal, the band have toured the world-over on the backs of their highly-acclaimed landmark albums, ‘Unchain the Wolves’, ‘Cold Steel…for an Iron Age’, ‘Defiance’, and ‘Phoenix Rising’. The albums can be streamed at the band’s official Bandcamp page. DESTRÖYER 666 news and tour information will be made available through the Season of Mist website, and the DESTRÖYER 666 Facebook page.